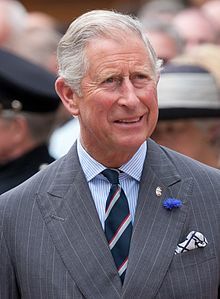 Charles, Prince o Wales (Charles Philip Arthur George;[fn 1] born 14 November 1948 in Lunnon), is teetelt in the United Kinrick 'The Prince o Wales, Duke o Cornwall an Yerl o Chester, Duke o Rothesay, Yerl o Carrick, Baron Renfrew an Laird o the Isles, Prince an Great Stewart o Scotland, Knicht o the Gairter an Knicht o the Thristle'. For ordinar in Ingland, Wales an Northren Ireland he is kent as the 'Prince o Wales' whiles in Scotland he is kent as the 'Duke o Rothesay' an in Cornwall the 'Duke o Cornwall'. He wis a sailor in the Ryal Navy an is nou a fou Admiral. In a siclike mainer he wis listit as a sodger an nou is a fou General in the Breetish Airmy. He is the Ryal Colonel o the The Black Watch, 3rd Battalion The Ryal Regiment o Scotland an the 51st Hieland, 7t Battalion The Ryal Regiment o Scotland. He wis listit as a pilot in the Ryal Air Force an is nou a fou Air Chief Marshal. Whane'er he is in Scotland he bides aither at Birkhall, Balmoral, Aiberdeenshire or the Pailace o Halyruidhoose in Edinburgh. He wis the Heich Commissioner o the Kirk o Scotland in 2000. The Duke o Rothesay is Heir Appearent tae Her Grace Queen Elizabeth II o the Unitit Kinrick. ↑ 1.0 1.1 As a teetled royal, Charles daes nae uise a faimily name, but, when ane is needit, it is Mountbatten-Windsor. Wikimedia Commons haes media relatit tae Charles, Prince of Wales. This page wis last eeditit on 13 Mey 2018, at 22:42.